Family Dasypodidae Armadillos: 20/21 species in 8 genera. Armadillos are recognised by the armour of scutes that covers their shoulders and pelvic regions. Three-banded armadillos, genus Tolypeutes, yellow or six-banded armadillos, Euphractus sexcinctus, and nine-banded armadillos, Dasypus novemcinctus, have a number of flexible half rings over the middle and back. This armour protects the animals against predators and spiny vegetation. In addition, some species protect their hairy, soft under surfaces by withdrawing their legs under their shoulders and hips and sitting tight on the ground; other species roll up. Armadillos are terrestrial and burrowing mammals equipped with muscular fore limbs and hind limbs and large sharp claws for digging in soil to find food and to excavate burrows and nests. They are nocturnal animals with poor eyesight but a well-developed sense of smell and/hearing. Different species occur in different regions of the Southern states of the U.S.A., Central and South America. Subfamily Dasypodinae � a yellow or six-banded armadillo, Euphractus sexcinctus, shows the typical armour, short sturdy legs and long claws of an armadillo. 1. Subfamily Dasypodinae - a foetus of a nine-banded armadillo, Dasypus novemcinctus, already shows the pattern of the armour that will protect it as an adult, including nine flexible half-rings that give this species its name. 2. Subfamily Chlamyphorinae � a fairy armadillo, Chlamyphorus truncatus. Fairy armadillos are the smallest armadillos. They are covered by a pinkish dorsal shell and dense long fur on their sides and ventral surface. Fairy armadillos live in small holes near ant colonies in dry grasslands and sandy plains, where thorn bushes and cacti grow, in Central Argentina, Paraguay and Boliva. They are rare, nocturnal creatures and seldom seen. Most armadillos are omnivorous consuming insects, especially ants and termites, tubers and carrion. The nine-banded long nosed armadillo feeds mainly on termites, ants and other insects but will also eat vegetable matter, carrion and the eggs of ground nesting birds. The six-banded long nosed armadillo feeds mainly on vegetable material but will also consume invertebrates, including ants and termites, and carrion. The three-banded armadillo feeds mainly on ants and termites. The fairy armadillo feeds mainly on ants and ant larvae. Armadillos have low metabolic rates and low body temperatures to prevent them overheating in closed burrows. Xenarthran skulls are the least complex of all mammals. Armadillos lack canines and incisors; they have uniform continuously growing peg-like cheek teeth (premolars and molars) which lack enamel. The teeth have open roots that allow for continuous growth. The peg-like teeth are used to mash up their food. Armadillos have numerous teeth: 14-18 per jaw. The jaws of species of Dasypus do not open wide and they catch their food with their tongues like anteaters do. 3. 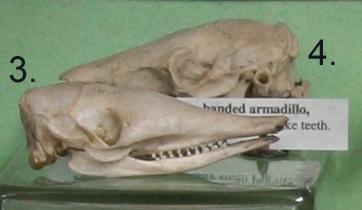 Slender snouted skull of a long-nosed, nine-banded armadillo, Dasypus novemcinctus, with many small peg-like cheek teeth. Dasypus spp. have to catch their food with their tongues as they cannot open their jaws very far. 4. Broad skull of a three-banded armadillo, Tolypeutes sp., with many small peg-like teeth. The nine-banded armadillo, Dasypus novemcinctus, is unique as a mammal in exhibiting obligate polyembryony. The female only produces one fertile egg at a time but this egg always develops into a number of genetically identical embryos or clones. It is possible that this system of producing a number of offspring solves the problem of how a female can give birth to several offspring when she only has room for one egg to develop prior to implantation. 5. 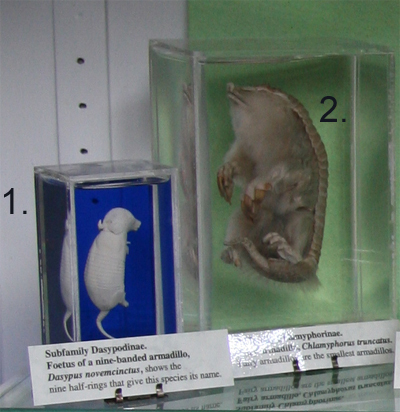 The preparation of the uterus of Dasypus novemcinctus shows how the four embryos are packed closely together in the uterus . 6. 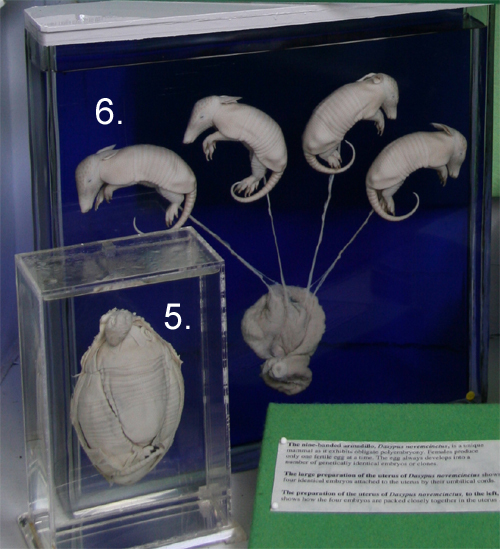 The large preparation of the uterus of Dasypus novemcinctus shows four identical embryos released from the uterus but still attached to it by their umbilical cords.